Whether you’re shopping for your first mountain bike or looking to upgrade, here are nine of the best entry level mountain bikes under $2,000. The $2,000 price point is where you’ll begin to see much higher quality shredding machines. This is also where you start to see full suspension, which will be absolutely worth the money, especially if rocks and roots are on the docket. Check out the full reviews below. Looking for something in a different price range? Here are our top mountain bikes under $500, for $1,000 or $1,500. Not sure where to start? Our Mountain Bike Buyer’s Guide has everything you need to know to find your perfect ride. If you are a smaller person this could be the perfect mountain bike for you. As someone who is 5’3”, the 27.5” wheel size was the best fit for me. While 29” wheels will roll over most anything, trying to whip a 29” bike around tight corners can prove difficult compared to a 27.5”. The hardtail combined with the 100mm front suspension makes this perfect for cross country trails. The 1×10 gear setup eliminates a front derailleur which results in a lighter bike and decreases the amount of parts that require maintenance. The Shimano Deore components are designed for someone who considers mountain biking a hobby. If you move up to the next component level, you’ll save some weight, but for someone who isn’t racing, Deore is just fine. Check for current price and sales. The GT Verb Expert is the perfect bike to shred through gnarly trails. If you are looking to get more serious about mountain biking, consider trying a full suspension. The geometry is designed to make the steeper terrain easier and allow you to take more adventurous and difficult lines. With 120mm front and rear suspension it is a perfect transition from a hardtail to full suspension. The Shimano Deore components are perfect for the hobbyist mountain biker. The Verb comes with wide handle bars that will make controlling your bike easier. WTB tubeless compatible rims are the perfect chance to switch to tubeless, if you haven’t done so already. Riding tubeless helps you avoid pinch flats and you’ll be able to ride a lower tire pressure, which helps the bike grip around corners. The bike sits at 32lbs, which is expected for a full suspension bike that is under $2,000. This a perfect bike for a weekend ride with the dudes where the climbs aren’t a race and the downhill is a place to shred. Another awesome entry level full suspension bike is the Giant Stance, which is capable of handling a wide variety of terrain. 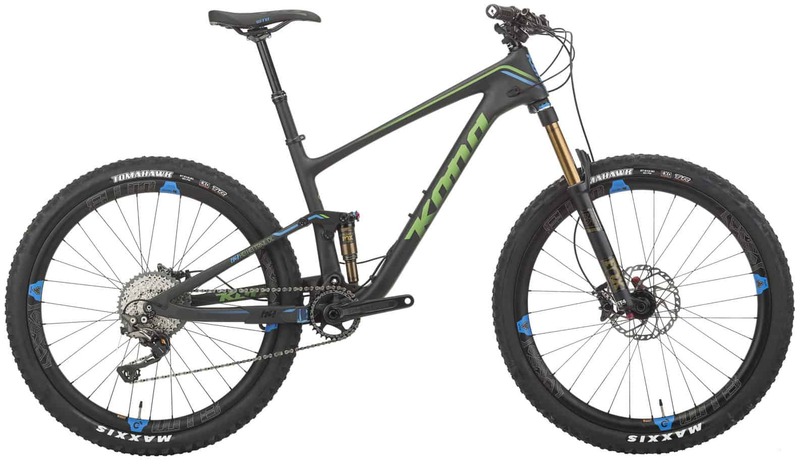 With 120mm front and rear, this bike is the perfect all mountain bike. The ALUXX-Grade aluminum frame has optimised strength to weight ratio, while keeping the price reasonable. The components consist of a mix of Shimano Deore and Shimano SLX (which is a step up from Deore). The Shimano M355 brakes are strong and reliable, and the rear suspension allows you to adjust the rebound speed to make the bike more dialed to your specific riding style. This is a nice feature to have on a mountain bike for this price. If you so choose, this frame also has guides for routing a dropper post. All of this comes at about 30lbs, which is a typical weight for a full suspension $2,000 mountain bike. Check with your local Giant dealer. The Santa Cruz Highball is a good entry level hardtail. The 100mm front travel is perfect for most any cross country trails. The 29” wheels will let the bike roll over obstacles much easier than other wheel sizes. The geometry also allows the bike to be whipped around corners more like a 27.5” version of the bike would. The head tube angle contributes to the bike’s climbing prowess, while maintaining stability and control on the downhill. The bike sits at about 27lbs, a competitive weight for the price. It’s also available in two color options. Not ready to jump onto a 29er? The Giant XTC is perfect for cross country trails. While this bike may not be the best choice for technical rock gardens, this light weight and nimble bike excels at climbing and displays super crisp handling on the flowy single track. The ALUXX-Grade aluminium frame has optimised strength to weight ratio, and the OverDrive 2 steer tube increases the stiffness and control to make this the perfect fast cross country bike. The XTC comes with a mix of Shimano SLX and Shimano Deore, whereas many bikes are equipped with just Shimano Deore (SLX is a step above Deore). If you are looking to get into cross country racing, this is a perfect entry level, light weight, hardtail. The bike comes with women specific grips and a saddle. Even though it’s a hardtail, the design allows for some flex, making longer rides more comfortable. The Juliana has slacker geometry than previous models, which allows for increased stability on the downhill, yet still climbs like a cross country bike. The 100mm front travel is perfect for any cross country trails. The stiff and durable WTB tubeless compatible rims will allow you to enjoy the tubeless world of no pinch flats and increased traction from decreased tire pressure. Just because your favorite trails are covered in snow, that doesn’t mean mountain biking is over until spring. Now you can ride through the winter with a bike that handles the snow. The Diamondback El Oso SLX fat bike is a perfect introduction to the fat bike world. The Shimano SLX components are a long lasting, smooth shifting set up. The bike can accommodate up to 5” wide tires, making snow a breeze to ride through. The 100mm front travel is sufficient for most obstacles you’ll encounter on a snowy ride. This full suspension trail riding mountain bike will hold up to even the toughest east coast rocks. It was introduced as a middle of the road mountain bike between Cannondale’s Scalpel, which has less suspension, and the Trigger (more suspension). The 120mm front and rear suspension along with the easy handling makes this bike shred downhill like the trigger, but on the climbs it is still fast and efficient, like the Scalpel. The 29 pound aluminum frame makes this bike slightly lighter than other similarly priced full suspension mountain bikes (notice the GT verb expert is about 32lbs). The Shimano Deore utilizes a lot of the technology developed for some of the more expensive components, while saving on weight. Check with your local Cannondale dealer. If you’re looking to buy one bike that can be both a cross country race bike and a weekend trail bike, the Santa Cruz Superlight D is your bike. With 100mm rear suspension and 120mm front suspension, this bike is a mix between your minimal suspension cross country bike and your 120mm+ all mountain bikes. The rear suspension can also be adjusted on the fly between trail, climb, and descend settings to allow for more versatility. Furthermore this bike has both 27.5” and 29” wheel size, depending on the bike size. The small and medium sizes use 27.5” whereas the large and XL use 29”. This allows for all riders to be able to better handle their bike instead of a small individual struggling with too large of a wheel size or vice versa. Related: Our roundup of the best bikes and gear on sale now.